Speaking of Chicago, I spy a few ex-Chicagoans (me, Hallie, & Lauren) on The Everygirl this morning… Check it out here! 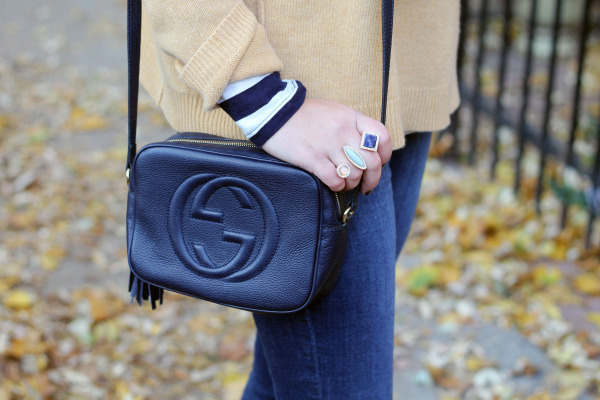 Layering a tissue-thin turtleneck under my sweaters has been my favorite way to later this fall! I’ve always been a fan of turtleneck tees and sweaters (#manrepelling) and they’re such a great way to add a little extra layer of warmth. I’ve been wearing turtlenecks ALL the time lately, too! They’re easy, warm and great for layering. I love how the beige and navy look paired together! Ahhh yes, Lincoln Park is my favorite neighborhood in Chicago. If I ever left NYC that’s the only place I would go. But let’s be honest – I’m never leaving!! Cute look. Love the hat!! That’s my old hood and I still miss it terribly. Love this layered look. I’m SO mad I didn’t buy those booties last season when you featured them. I LOVE them on every outfit you wear them. Any idea if Express will be bringing them back or do have you been able to locate a similar style elsewhere?! 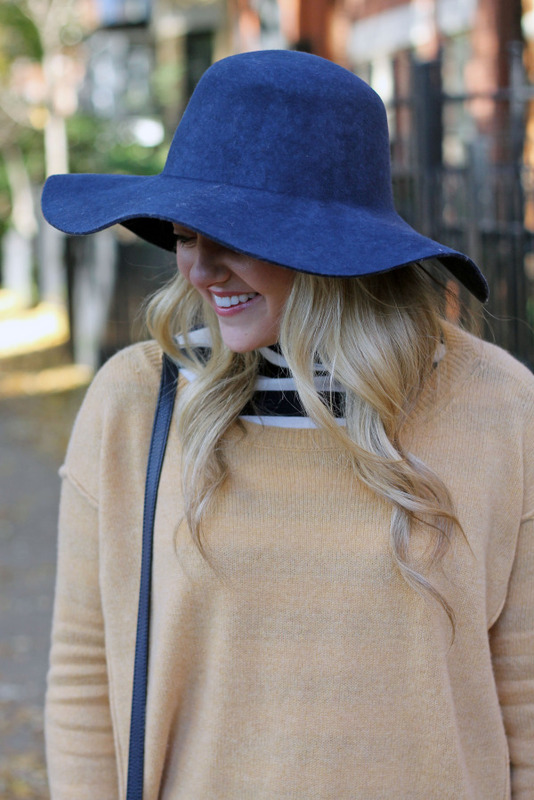 Super cute and original way to layer for the colder weather! I love turtlenecks! They’re so fun to wear, because you can really dress them up or down. The little details in this outfit are perfect, like the ring, hat bracelets, and bag. Really beautiful. Love your look! Very chic! You named so many of my favorites! Need to back soon! Now that is a great hat! I love your hat! What a cute look! Beautiful boho chic outfit! Great hat and jeans! Love your layering! And that hat was made for you! Love the stripes paired with that hat! too cute! Gorgeous outfit! That hat literally looks so perfect on you, and you styled it amazing! Love the turtleneck! I love the idea of wearing a thin turtleneck under a sweater instead of a cami. I often get bored of wearing the same “uniform” in the winter! You carry off that hat so well! I love your sweater! Such a pretty color. Looks great over the stripes. I love that sweater with the turtle neck! Love this! 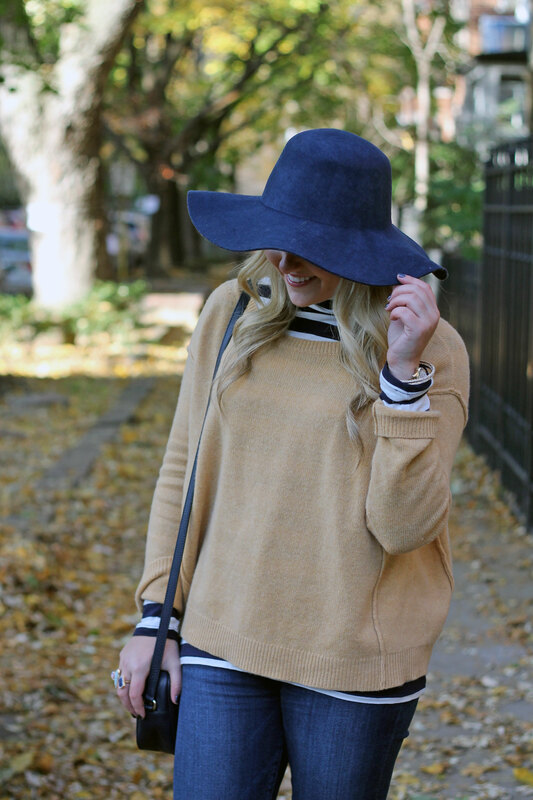 I am loving stripes as layers beneath a solid sweater or poncho. It just automatically makes it more polished! Such a cute look and love your bag! I just bought a bag from the Soho collection and I swear the pebbled leather is amazing! beautiful casual and cozy! love the bag! Love the hat and that camel sweater. I have a sweater very similar to that and never though to pair anything underneath it! Love this look! !